Spacious 5 bedrooms 3 full baths / 2 half baths, brick story and a half with basement in highly sought after Barclay Downs in beautiful SouthPark minutes to shopping and restaurants. Freshly painted from top to bottom in beautiful neutral color pallet. This home has hardwood floors on two main levels. Lovely, large living room with faux fireplace and dining room open to charming kitchen with white shaker cabinets, granite tile countertops, induction cooktop and stainless appliances. 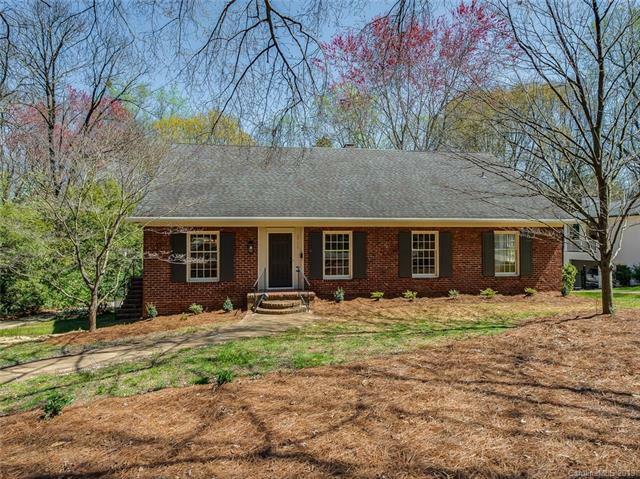 Cozy den with painted brick fireplace and built in cabinets opens to oversized sunroom with new sisal carpet, baseboard heat & newer mini-split system. Generous master suite down that could be expanded into other bedroom in the future. Upstairs boasts generously sized secondary bedrooms. Partially finished basement with finished rec room, laundry and huge unfinished space for storage or could be finished at a future date. 2 car carport under sunroom. Wonderful backyard backing to trees.